Never before have I been booked because I posted a gif from The IT Crowd on twitter, it’s unlikely (but I’m not ruling it out) that this will happen again. It turns out this is an excellent way of choosing a photographer because we were the perfect match! You can’t see obviously but I laughed as much as everyone else in these photos, it turned out that Vicky and bridesmaid Melbob are fans of the BBC Comedy Look Around You. I rarely encounter anyone who has seen it, but if they have they always love it. So we spent quite a bit of the day quoting it, even in the lovely thank you letter at the bottom of the post (complete with a polaroid of myself taken by Vicky’s brother). 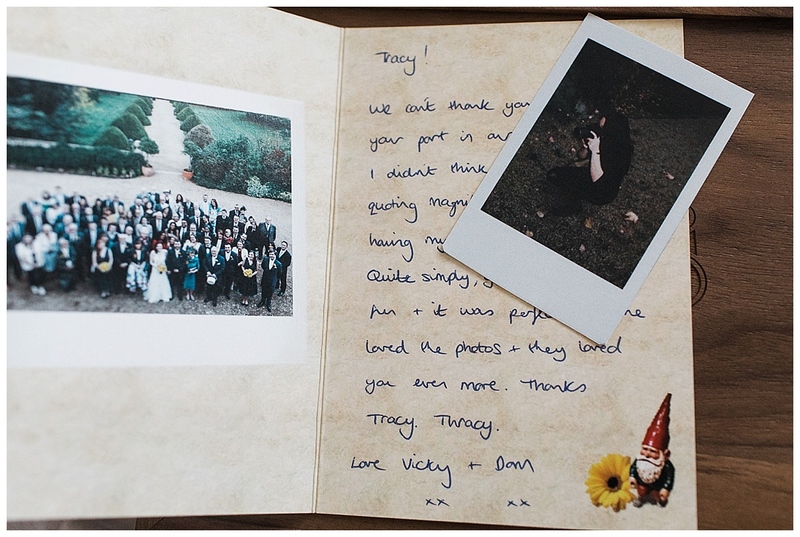 Vicky is also known as The Girl With The Button Tattoo and their love of Formula 1 was hard to miss on their day, the wonderful wedding venue Manor by the Lake even raised a chequered flag over the Victorian manor in Cheltenham. We went for a little jaunt around the grounds for a few couple portraits and in just that brief time it was clear these two make each other laugh so much that they were meant to be. We may have also commented on the ducks in the style of this Birds of Britain sketch. Perhaps. Even their choice of music for walking down the aisle made us all laugh, Thunderstruck! If you know the lyrics it was a choice that briefly incorporates Dom’s love of trains, which has shaped his career. Family and friends all contributed so much to the day, which was why their day was so perfect. Their personalities were all over this wedding!